Artist's depiction of Saint Paul Writing His Epistles, 16th century (Blaffer Foundation Collection, Houston, Texas). Most scholars think Paul actually dictated his letters to a secretary, such as Tertius named in Romans 16:22. In Paul's thinking, instead of humanity divided as "Israel and the nations" which is the classic understanding of Judaism, we have "Israel after the flesh" (i.e., the Jewish people), non-Jews whom he calls "the nations," (i.e., Gentiles) and a new people called "the church of God" made of all those whom he designates as "in Christ". Paul draws on several interpretative frames to solve this problem, but most inportantly, his own experience and understanding. The kerygma from 1:Cor.15:3-5 refers to two mythologies: the greek myth of the noble dead, to which the Maccabean notion of martyrdom and dying for ones people is related; and the Jewish myth of the persecuted sage or righteous man, c.q. the "story of the child of wisdom." The notion of 'dying for' refers to this martyrdom and persecution. [note 2] 'Dying for our sins' refers to the problem of gentile Torah-observers, who, despite their faithfulness, are not Jewish by birth, and are therefore 'sinners', excluded from God's convenant. Jesus' death and resurrection solved this problem of the exclusion of the gentles from God's convenant, as indicated by Rom 3:21-26. E. P. Sanders introduced a new perspective on Paul with his 1977 publication Paul and Palestinian Judaism. According to Sanders, western theology has misunderstood the Judaic context of Paul's religious views. Law-keeping and good works were not means to enter the covenant (Legalism (theology)), but a sign of being in, and a means of keeping, the Covenant. Sanders called this pattern of religion "covenantal nomism." Sanders' perspective calls the traditional Protestant understanding of the doctrine of justification into serious question. Sanders' publications, such as Paul and Palestinian Judaism in 1977 and Paul, the Law, and the Jewish People in 1983, have since been taken up by Professor James Dunn, who coined the phrase "The New Perspective on Paul"; and N.T. Wright, Anglican Bishop of Durham. Wright notes the apparent discrepancy between Romans and Galatians, the former being much more positive about the continuing covenantal relationship between God and his ancient people than the latter. Wright contends therefore that works are not insignificant. [Romans 2:13] According to Wright, Paul distinguishes between works which are signs of ethnic identity, and those which are a sign of obedience to Christ. Within the last three decades, a number of theologians have put forward other "new perspectives" on Paul's doctrine of justification, and even more specifically on what he says about justification by faith. According to Simon Gathercole, "Justification by faith" means God accepts Gentiles in addition to Jews, since both believe in God. Paul writes in his letter to the Romans, "For we maintain that a man is justified by faith apart from observing the law. Is God the God of Jews only? Is he not the God of Gentiles too? Yes, of Gentiles too, since there is only one God, who will justify the circumcised by faith and the uncircumcised through that same faith". [Romans 3:28–30] Faith is the central component of Paul's doctrine of justification — meaning that Gentiles don't need to become Israelites when they convert to Christianity, because God is not just the God of one nation, but Gentile and Jew alike. The Book of Acts contains an account of Paul's travels and deeds, his conflicts with Greeks and Jews during the Julio-Claudian dynasty, and his interactions with the original apostles. The value of the historical information in Acts, however, is challenged by some scholars. They believe that it was written from a perspective of reconciliation between Pauline Christianity and its opponents, so portrays Paul as a law-abiding Jew and omits his dispute with Peter, only briefly mentioning the split with Barnabas. [Acts 15:36–41] Irenaeus in the 2nd century is the first of record to quote Acts, and he used it against Marcion who rejected the Hebrew Bible. See also Luke–Acts. Mediterranean Basin geography relevant to Paul's life in the first century, stretching from Jerusalem in the lower-right to Rome in the upper-left. Map of Alexander's empire, c. 334–323 BC, stretching east and south of Macedonia. Hellenistic Judaism was a movement which existed in the Jewish diaspora and the Holy Land that sought to establish a Hebraic-Jewish religious tradition within the culture and language of Hellenism. The major literary product of the contact of Judaism and Hellenistic culture is the Septuagint (begun in the 3rd century BC). Major authors are Philo of Alexandria (died c. 50 AD), Josephus (died c.100 AD), and some would claim also Paul. The decline of Hellenistic Judaism in the 2nd century AD is obscure. It may be that it was marginalized by, absorbed into or became Early Christianity. Recently, Talmudic scholar Daniel Boyarin has argued that Paul's theology of the spirit is more deeply rooted in Hellenistic Judaism than generally believed. In A Radical Jew, Boyarin argues that Paul the Apostle combined the life of Jesus with Greek philosophy to reinterpret the Hebrew Bible in terms of the Platonic opposition between the ideal (which is real) and the material (which is false). Before Paul's conversion, Christianity was part of Second Temple Judaism. Gentiles who wished to join Jewish Christian sects, such as the Ebionites or Nazarenes, were expected to convert to Judaism, which likely meant submission to adult male circumcision for the uncircumcised, following the dietary restrictions of kashrut, and more (see 613 mitzvot for details). During the time period, there were also "partial converts", such as gate proselytes and Godfearers. Paul insisted that faith in Christ (see also Faith or Faithfulness) was sufficient for salvation and that the Torah did not bind Gentiles. Prior to his conversion, Paul says he was a Pharisee who "violently persecuted" the followers of Jesus. After his conversion, Paul's attitude changed dramatically, becoming an 'apostle to the Gentiles', who envisioned a New Covenant in which both Jews and Gentiles would partake. Paul made explicit in Galatians 1:17 that he did not discuss with the "Pillars of the Church" after he had received his revelation to be an apostle,[Gal. 1:15–16] that he saw no one except Cephas (Peter) and James, when he was in Jerusalem three years after the revelation[Gal 1:18–24] and implies he did not explain his gospel to them until 14 years later[Gal 2:1–2] in a subsequent trip to Jerusalem. According to Acts, Paul began working along the traditional Jewish line of proselytizing in the various synagogues where the proselytes of the gate (a biblical term. For example, see Exodus 20:10) and the Jews met; and only because he failed to win the Jews to his views, encountering strong opposition and persecution from them, did he turn to the Gentile world after he had agreed at a convention with the apostles at Jerusalem to admit the Gentiles into the Church only as proselytes of the gate, that is, after their acceptance of the Noachian laws. [Acts 15:1–31] , yet no reference of Noachian Laws can be found in Acts 15-1-31. In Galatians 1:17,18, Paul declares that, immediately after his conversion, he went away into Arabia, and again returned to Damascus. "Then after three years, I went up to Jerusalem to visit Cephas." In Acts, no mention is made of Paul's journey into Arabia; and the journey to Jerusalem is placed immediately after the notice of Paul's preaching in the synagogues. Hilgenfeld, Wendt, Weizäcker, Weiss, and others allege here a contradiction between the writer of the Acts and Paul. R. Emden, in a remarkable apology for Christianity contained in his appendix to "Seder 'Olam" gives it as his opinion that the original intention of Jesus, and especially of Paul, was to convert only the Gentiles to the seven moral laws of Noah and to let the Jews follow the Mosaic law — which explains the apparent contradictions in the New Testament regarding the laws of Moses and the Sabbath. 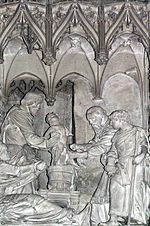 Circumcision of Christ, sculpture in the Cathedral of Chartres. Paul, who called himself "the apostle of the Gentiles", criticised the practice of religious male circumcision, perhaps as an entrance into the New Covenant of Jesus. In the case of Timothy, whose mother was a Jew but whose father was a Greek, Paul personally circumcised him "because of the Jews". [Acts 16:1–3] Some believe that he appeared to praise its value in Romans 3:1–2, yet later in Romans 2 we see his point. In 1 Corinthians 9:20–23 he also disputes the value of circumcision. Later Paul more explicitly denounced the practice, rejecting and condemning those who promoted circumcision to Gentile converts. Paul warned that the advocates of circumcision were "false brothers".[Gal. 2:4] He accused Galatian converts who advocated circumcision of turning from the Spirit to the flesh: "Are you so foolish, that, whereas you began in the Spirit, you would now be made perfect by the flesh?"[Gal. 3:3] He accused advocates of circumcision of wanting to make a good showing in the flesh[Gal 6:12] and of glorying or boasting of the flesh.[Gal. 3:13] Some believe Paul wrote the entire Epistle to the Galatians attacking circumcision, saying in chapter five: "If ye be circumcised, Christ shall profit you nothing." His attitude towards circumcision varies between his outright hostility to what he calls "mutilation" in Philippians 3:2–3 to praise in Romans 3:1–2 and his willingness that Timothy be circumcised, recorded in Acts 16:1–3 However, such apparent discrepancies have led to a degree of skepticism about the reliability of Acts. Baur, Schwanbeck, De Wette, Davidson, Mayerhoff, Schleiermacher, Bleek, Krenkel, and others have opposed the authenticity of the Acts. An objection is drawn from the discrepancy between Acts 9:19–28 and Gal. 1:17–19. On the contrary, when they saw that I had been entrusted with the gospel for the uncircumcised, just as Peter had been entrusted with the gospel for the circumcised (for he who worked through Peter making him an apostle to the circumcised also worked through me in sending me to the Gentiles), and when James and Cephas and John, who were acknowledged pillars, recognized the grace that had been given to me, they gave to Barnabas and me the right hand of fellowship, agreeing that we should go to the Gentiles and they to the circumcised. Paul was critical of "Judaizers" within the Church. This conflict between Paul and his opponents may have been the reason for the Council of Jerusalem. [Acts 15:1–35] Here James, Paul, and the other leaders of the Early Christian movement agreed that Gentile converts needed only to follow the "three exceptions",[Acts 15:20,29] (counted by some as four) laws that roughly coincide with Judaism's Seven Laws of Noah said to be established by God for all humankind. [Genesis 9:1–17] This Apostolic Decree, still observed by the Orthodox Church, is similar to that adopted by Rabbinic Judaism, which teaches that Gentiles need only follow the Noachide Laws to be assured of a place in the World to Come. See also Noahidism and Dual-covenant theology. Paul seems to have refused "to be tied down to particular patterns of behavior and practice." [1 Cor. 9:20–23] He does not engage in a dispute with those Corinthians who apparently feel quite free to eat anything offered to idols, never appealing or even mentioning the Jerusalem council. He rather attempts to persuade them by appealing to the care they should have for other believers who might not feel so free. Paul claims the "pillars" of the Church had no differences with him. On the contrary, they gave him the "right hand of fellowship", he bound for the mission to "the uncircumcised" and they to "the circumcised", requesting only that he remember the "poor". Whether this was the same meeting as that described in Acts is not universally agreed. According to an article in the Jewish Encyclopedia, great as was the success of Barnabas and Paul in the heathen world, the authorities in Jerusalem insisted upon circumcision as the condition of admission of members into the church, until, on the initiative of Peter, and of James, the head of the Jerusalem church, it was agreed that acceptance of the Noachian Laws — namely, regarding avoidance of idolatry, fornication, and the eating of flesh cut from a living animal — should be demanded of the heathen desirous of entering the Church. Since F.C. Baur, scholars have found evidence of various strands of thought within Early Christianity. James D. G. Dunn proposes that Peter was a "bridge-man" between the opposing views of Paul and James the Just. Rembrandt's Two old men disputing, 1628. This painting has been thought to depict Peter and Paul. Despite the agreement presumably achieved at the Council of Jerusalem as understood by Paul, Paul recounts how he later publicly confronted Peter, also called the "Incident at Antioch" over Peter's reluctance to share a meal with Gentile Christians in Antioch. Writing later of the incident, Paul recounts: "I opposed [Peter] to his face, because he was clearly in the wrong". Paul reports that he told Peter: "You are a Jew, yet you live like a Gentile and not like a Jew. How is it, then, that you force Gentiles to follow Jewish customs?"[Gal. 2:11–14] Paul also mentions that even Barnabas (his travelling companion and fellow apostle until that time) sided with Peter. The final outcome of the incident remains uncertain. The Catholic Encyclopedia states: "St. Paul's account of the incident leaves no doubt that St. Peter saw the justice of the rebuke." In contrast, L. Michael White's From Jesus to Christianity states: "The blowup with Peter was a total failure of political bravado, and Paul soon left Antioch as persona non grata, never again to return." For you, brothers and sisters, became imitators of the churches of God in Christ Jesus in Judea, for you suffered the same things from your own compatriots as they did from the Jews, who killed both the Lord Jesus and the prophets and drove us out; they displease God and oppose everyone by hindering us from speaking to the Gentiles so that they may be saved. Thus they have been constantly filling up the measure of their sins; but God's wrath has overtaken them at last. Paul's theology of the gospel contributed to the separation of the messianic sect of Christians from Judaism, a development contrary to Paul's own intent. He wrote that faith in Christ was alone decisive in salvation for Jews and Gentiles alike, making the schism between the followers of Christ and mainstream Jews inevitable and permanent. Without Paul's campaign against the legalists who opposed him, Christianity may have remained a dissenting sect within Judaism, for example see Noahidism. He successfully argued that Gentile converts did not need to follow Jewish customs, get circumcised, follow Jewish dietary restrictions, or otherwise observe Mosaic law, see also Antinomianism in the New Testament and Abrogation of Old Covenant laws. Nevertheless, in his Epistle to the Romans he insisted on the positive value of the Law (see also Pauline passages opposing antinomianism) in its divine form. Since Paul's time, the polemical contrast that he made between the old and the new way of salvation has usually been weakened, with an emphasis on smooth development (Supersessionism) rather than stark contrast (Marcionism). See also New Perspective on Paul. Pauline Christianity is a term used to refer to a branch of Early Christianity associated with the beliefs and doctrines espoused by Paul the Apostle through his writings. The term is generally considered a pejorative by some who believe it carries the implication that Christianity as it is known is a corruption of the original teachings of Jesus, as in the doctrine of the Great Apostasy. Messianics understand that Paul the Apostle (who is often referred to as Sha’ul, his Hebrew name) remained a Jewish Pharisee even as a believer until his death. This is based on Acts 23:6, detailing events after Paul's acceptance of Jesus as Messiah. "But when Paul perceived that the one part were Sadducees, and the other Pharisees, he cried out in the council, Men [and] brethren, I am a Pharisee, the son of a Pharisee: of the hope and resurrection of the dead I am called in question." 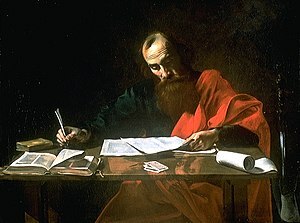 Messianics cite the cutting off of Paul’s hair at Cenchrea because of a vow he had taken (Acts 18:18), references in passing to his observing the Jewish holidays (Acts 18:21; Acts 20:6; Acts 20:16) and his consistent good standing with his Rabbinic master Gamaliel, to show that he was wholly in continued observance of the laws and traditions of Judaism. Saint Paul according to Acts 21:17–29 and Acts 24:17–18 is recorded as observing Jewish laws of purification in the Temple in Jersusalem. They maintain that Paul never set out to polarize the gospel between faith and righteous works, but that one is necessary to maintain the other. Stephen Westerholm: "For Paul, the question that “justification by faith” was intended to answer was, “On what terms can Gentiles gain entrance to the people of God?” Bent on denying any suggestion that Gentiles must become Jews and keep the Jewish law, he answered, “By faith—and not by works of the (Jewish) law.”"[web 1] Westerholm refers to: Krister Stendahl, The Apostle Paul and the Introspective Conscience of the West, Harvard Theological Review 56 (1963), 199–215; reprinted in Stendahl, Paul Among Jews and Gentiles and Other Essays (Philadelphia: Fortress, 1976), 78–96. ^ "Paul the Jew as Founder of Christianity?". Huffington post. Retrieved August 27, 2017. ^ a b McGarvey on Acts 16: "Yet we see him in the case before us, circumcising Timothy with his own hand, and this 'on account of certain Jews who were in those quarters.'" ^ "making themselves foreskins"; I Macc. i. 15; Josephus, "Ant." xii. 5, § 1; Assumptio Mosis, viii. ; I Cor. vii. 18;, Tosef. ; Talmud tractes Shabbat xv. 9; Yevamot 72a, b; Yerushalmi Peah i. 16b; Yevamot viii. 9a; ; Catholic Encyclopedia: Circumcision: "To this epispastic operation performed on the athletes to conceal the marks of circumcision St. Paul alludes, me epispastho [1 Cor. 7:18]." ^ Perkin, Corrie (2006-02-25). "Oh! We've lent the Rembrandt". The Age. Fairfax. Retrieved 2010-04-29. ^ White, L. Michael (2004). From Jesus to Christianity. HarperSanFrancisco. p. 170. ISBN 0-06-052655-6. ^ Carroll, James (2001). Constantine's Sword: The Church and The Jews (First Mariner Books edition 2002 ed.). Boston/New York: Houghton Mifflin. p. 85. ISBN 0-395-77927-8.